Piaf’s tumultuous life got off to a stormy start. Born Edith Gassion in Paris, she was abandoned by her mother and later traveled with her father, singing on the street while he performed acrobatics. The tiny singer was discovered by a nightclub owner who gave her the stage name “Piaf,” Parisian slang for sparrow. She quickly became a star, singing tragic songs about heartbreak that have been called a French equivalent of the blues. Piaf toured the U.S. ten times and sang twice at Carnegie Hall. In 1960, the ailing chanteuse discovered the defiant song that would become her anthem, “Non, Je Ne Regrette Rien” (“No Regrets”). Miles Davis was at the forefront of jazz musicians for decades, setting trends and exploring musical styles from bebop through cool jazz, fusion and funk. His restless musical exploration made him a hero to many, while sometimes confounding critics and fans. Among his many influential recordings are Birth of the Cool, Kind of Blue, Sketches of Spain, and In a Silent Way. He was also a great bandleader, and many important musicians rose to prominence in his bands, including saxophonists John Coltrane and Wayne Shorter; drummers Tony Williams and Jack DeJohnette; and pianists Bill Evans, Chick Corea, and Herbie Hancock. Davis’ music will long be remembered for its profound depth of feeling. By the time of his death in 1991, he had won many prizes and honors, including a Grammy Award for Lifetime Achievement. In 1984, he received Denmark’s prestigious Léonie Sonning Music Prize. In 1989, he was awarded the Grande Médaille de Vermeil by the city of Paris, which was presented to him by Jacques Chirac, then mayor and later president of France. Art director Greg Breeding designed the stamps using an undated, black-and-white photo of Piaf made by Studio Harcourt Paris and a black-and-white photo of Davis, from 1970, by David Gahr. The Edith Piaf and Miles Davis stamps are being issued as Forever stamps in self-adhesive sheets of 20 (10 of each design). Forever stamps are always equal in value to the current First-Class Mail one-ounce rate. At the time of issuance, the Edith Piaf and Miles Davis stamps are being sold at a price of 45 cents each, or $9 per sheet. 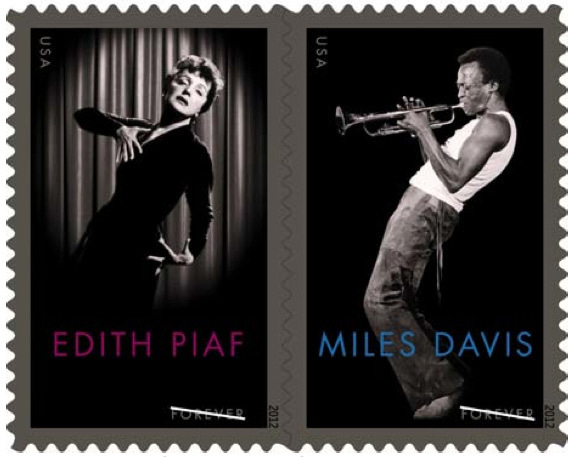 Customers may view the Edith Piaf and Miles Davis Forever stamps, as well as many of this year’s other stamps, on Facebook at facebook.com/USPSStamps, through Twitter @USPSstamps or on the website Beyond the Perf at beyondtheperf.com/2012-preview. Beyond the Perf is the Postal Service’s online site for background on upcoming stamp subjects, first-day-of-issue events and other philatelic news. Please Note: For broadcast quality video and audio, photo stills and other media resources, visit the USPS Newsroom at http://about.usps.com/news/welcome.htm. For reporters interested in speaking with a regional Postal Service public relations professional on this issue, please go to http://about.usps.com/news/media-contacts/usps-local-media-contacts.pdf.